Following is a list of Thai Restaurants all over Brisbane, Queensland Australia. 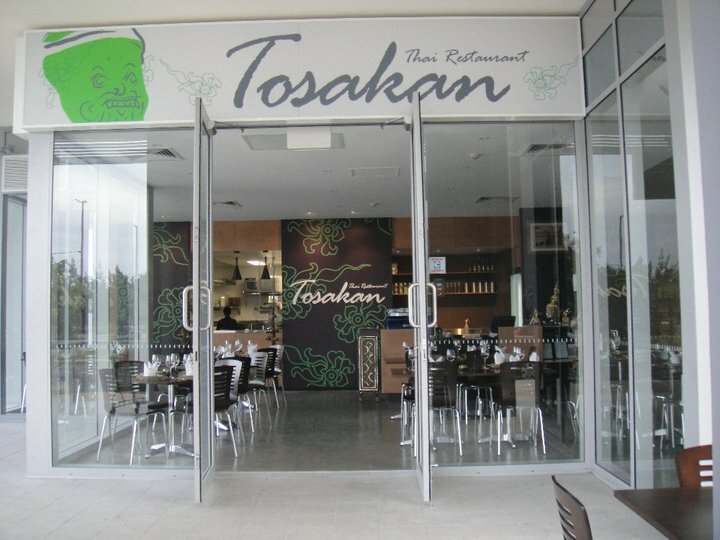 Tosakan Thai Restaurant (reviews) 23 Playfield St Chermside QLD 4032 Ph: (07) 3350 5371. Open times: Monday - Friday 11am - 10:30 pm, Saturday - Sunday 5:30 pm - 10:30 pm. For restaurant reviews for Tosakan Thai Restaurant click here. Chilli and Spice Thai Restaurant 128 Charolette St Brisbane Ph: (07) 3012 9888. Open Mon - Fri for breakfast, lunch and dinner. Saturday dinner. Closed Sunday. 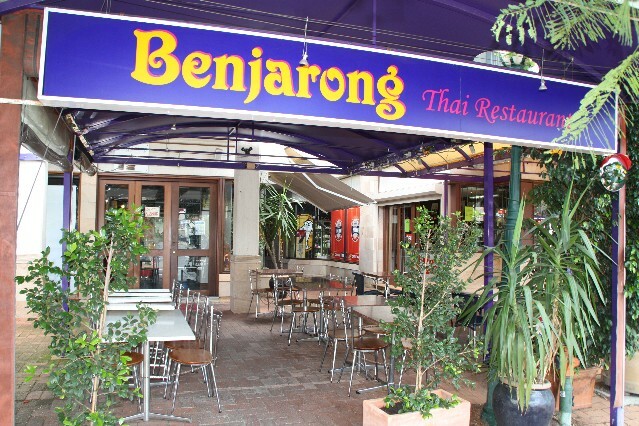 Benjarong Thai Restaurant (reviews) 7/1 Park Rd Milton Brisbane Ph: (07) 3367 8766. Open for lunch Mon - Fri 11.30am - 2.30pm. Open for dinner 7 nights a week 5.30pm - 11pm. For restaurant reviews for Benjarong Thai Restaurant click here. Mons Man Sabai Thai Garden Restaurant 12 Martha St Camp Hill Ph: (07) 3843 5366. Open 7 nights for dinner. Thai Siam Restaurant 41 Wynyard St Cleveland Ph: (07) 3821 5786. Open for lunch and dinner Tuesday to Sunday. Saturday dinner only. Baan Thai Restaurant Shop 1 3370 Pacific Hwy Springwood Ph: (07) 3808 2222. Fully licensed and BYO restaurant (wine only). Open for lunch Tuesday - Friday and Sunday. Dinner Tuesday to Sunday. Temple Thai Restaurant (reviews) 21 Park Rd Milton Ph: (07) 3369 8822. Open everyday from 11am - 10pm. Serve their own Yum Cha daily. For restaurant reviews for Temple Thai Restaurant click here. Royal Thai Orchard Restaurant 45 Little Crib St Milton Ph: (07) 3229 2588. Also at Exit 20, 3374 Pacific Hwy Springwood. Ph: (07) 3808 2853. Open for lunch Monday to Friday. Open for dinner 7 nights. Thai Ayuthaya Restaurant Shop 13 - 14 725 Gympie Rd Chermside Ph: (07) 3350 2828. Also at 252 Kelvin Grove Rd Kelvin Grove Ph: (07) 3356 9926. Thai Thani Restaurant 554 Lutwyche Rd Lutwyche Ph: (07) 3857 2338. Open 7 nights 5.00pm - 9.30pm. The Green Mango Thai Restaurant 5/63 Magregor Rd Bardon Ph: (07) 3369 2838. Open for lunch Wed - Friday. Open for dinner 7 nights 5.30pm - 10pm. Thai Poncana Cafe 2/189 Oxford St Bulimba Ph: (07) 3217 9600. Open for lunch everyday except Saturday. Open for dinner 7 nights. 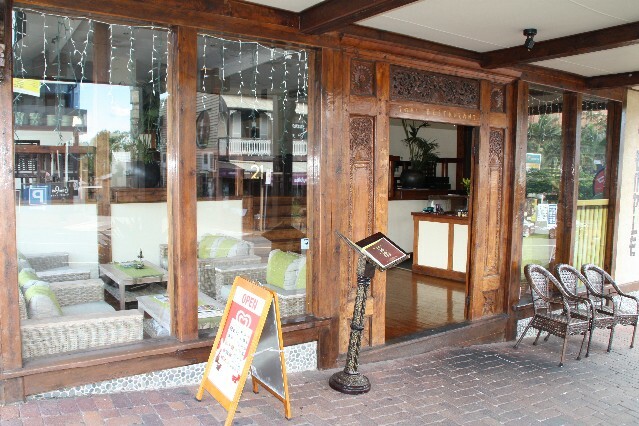 Talay Thai Restaurant Shop 1 145 Racecourse Rd Ascot Ph: (07) 3868 2833. Open for dinner Tuesday - Sunday 5.30pm to late. Fully licensed and BYO wine only. $2 corkage per person. Thai Boat Restaurant 99 Cambridge Parade Manly Harbour Village Ph: (07) 3396 1600. Open 7 nights for dinner. Fully licensed and BYO wine only. Siam Sunset Thai Restaurant Times Square Shopping Centre 323 Oxley Rd Graceville Ph: (07) 3379 7000. Open 7 nights for dinner from 5pm. Also at Kersley Rd Shopping Village Cnr Kersley and Kemore Rds Kenmore Ph: (07) 3878 5111. Open Tuesday to Sunday for dinner. 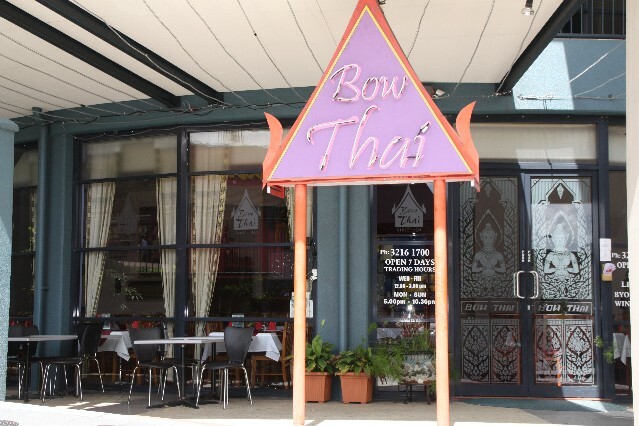 Bow Thai Restaurant (reviews) Shop 14 Cathedral Place Fortitude Valley Ph: (07) 3216 1700. BYO restaurant (wine only) $2 corkage charge per person. Entree prices $7.20 - $8.50. Main meal prices $16.90 - $21.90. For restaurant reviews for Bow Thai Restaurant click here. Tara Thai Restaurant 174 Wickham St Fortitude Valley Ph: (07) 3666 0755. Fully licensed and BYO beer and wine. Open for lunch Monday to Friday. Open for dinner 7 nights per week. Thai on Brunswick 455 Brunswick St Fortitude Valley Brisbane. Ph: (07) 3216 0085. Open for lunch Wed to Fri from 11am. Open for dinner 6 nights from Wednesday to Monday 5pm - 10pm. Closed Tuesday. 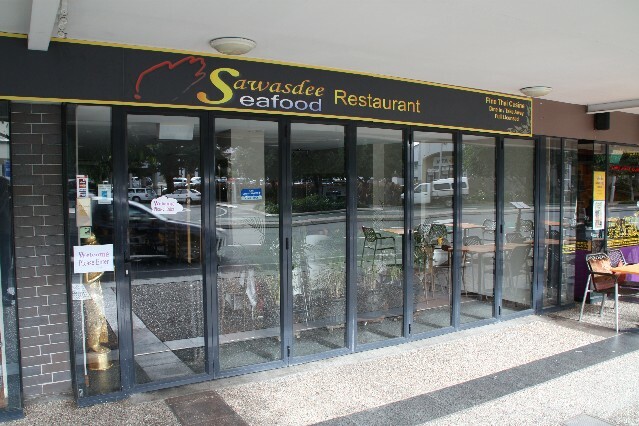 Sawasdee Thai Seafood Restaurant (reviews) Shop 6 220 Melbourne Street West End Brisbane Ph: (07) 3255 3300. Open 7 days a week from 11am - 10pm, lunch 11am - 3pm, dinner 5pm - 10pm. For restaurant reviews for Sawasdee Thai Seafood Restaurant click here. 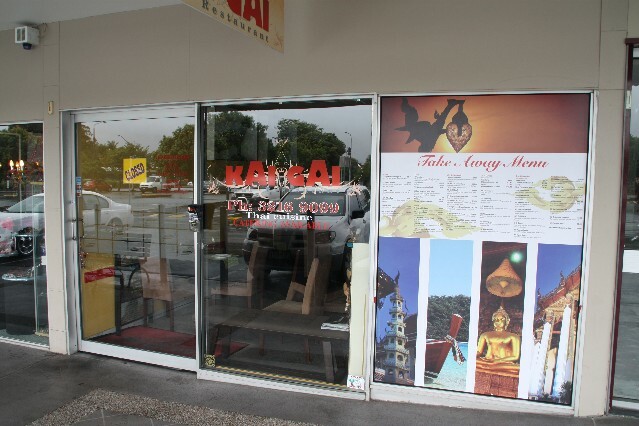 Kai Gai Thai Restaurant (1 review) Shop 21B 663 Beenleigh Road Sunnybank Brisbane Ph: (07) 3216 9099. Open for lunch Wed - Sun and dinner 7 nights a week. For restaurant reviews for Kai Gai Thai Restaurant click here. Thai Terrace Restaurant 151 Baroona St Rosalie Ph: (07) 3367 0962. Licensed and BYO (wine only). My Thai Restaurant 113 Haig St Auchenflower Ph:(07) 3217 7277. Fully licensed and BYO restaurant. $2 corkage per person. Open for dinner Tuesday to Sunday 5.30pm - 10pm. Also run Thai cooking classes. Caxton Thai Restaurant 47B Caxton St Petrie Terrace Ph: (07) 3367 0300. Open for dinner 7 nights per week. Home delivery available 6pm - 9.45pm. Sawadee Ka Fine Thai Cuisine Restaurant Shop 6/220 Melbourne St West End Brisbane Ph: (07) 3255 3300. Open for lunch Monday to Friday 11.30am - 2.30pm and open for dinner 7 nights 5.30pm - 9.30pm. The Thai Orchard Restaurant 1898 Logan Rd Mt Gravatt Ph: (07) 3849 6388. Open for lunch and dinner Sunday to Friday. Open for dinner Saturday night. Mon's Thai Rarnaharn Restaurant Cnr Eildon and Lutwyche Rd Windsor. Ph: (07) 3857 8375. Open for coffee morning, lunch and dinner 7 days a week. Thai Lovers Restaurant Shop 12/696 New Cleveland Rd Gumdale Ph: (07) 3390 6369. Open for dinner Tuesday to Sunday night 5pm till late. BYO restaurant. $2 corkage per person. Thai Chada Restaurant Shop 1/8 Days Rd Grange. Ph: (07) 3856 6455. Open 7 nights from 5pm - 10pm. Also at 708 Sandgate Rd Clayfield Ph: (07) 3262 7922. Thai Country Restaurant 928 Logan Rd Holland Park Ph: (07) 3847 6487. Open for lunch and dinner 7 days a week.